I’ve seen Attipas baby shoes around, but had completely dismissed them as another pointless baby product. 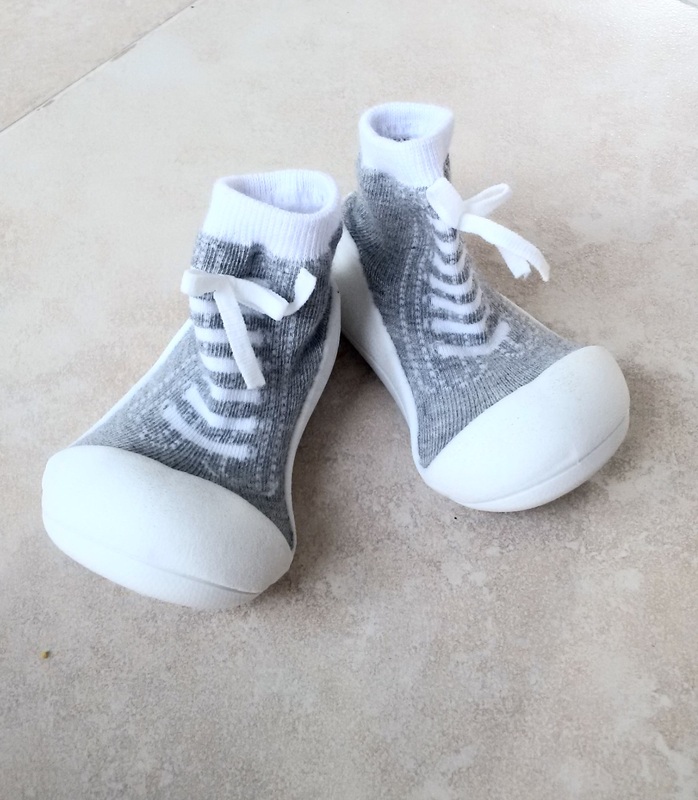 First of all, they kind of look like clown shoes, and second, they look big and bulky and I didn’t imagine that they would be very easy for tots to walk in. However, walking through Hamleys yesterday, the stock on the shelves caught my attention. Zachy is wanting to walk everywhere at the moment now that he has found his feet, and while it’s pretty clean in Dubai, I don’t particularly want him wandering around with no protection on his feet outside of the house. I had bought him some sandals a couple of weeks ago, but at only 10 months old he was having trouble walking as they were making him trip. Becoming more of a hazard than a protection I stopped using them. On top of this, Zachy had been bitten on the foot by an ant playing in the garden last week, so I’ve been on the lookout for safe, suitable protection for him to wear outdoors. Seeing them in Hamleys for only AED 89, I grabbed a box and decided to try one on Zachy, just for t he sake of it. I was really surprised at how good they looked! With a chubby little baby foot inside, they no longer resembled clown shoes, but from a distance looked like actual shoes. With a snug rubber base and stretch fabric top (much like a sock), they fit perfectly on Zachy’s little feet, allowing him to toddle around freely. In addition, the rubber sole has holes punched through which allows baby feet to breathe – a something of a must in Dubai’s sticky climate. As posted yesterday, we had a fab afternoon in the soft play area in Magic Planet, City Centre Mirdif, and he wore his stylish new shoes the whole time without bother. I got a few nice shots of him wearing them so you can see for yourself how good they look when actually on a baby’s foot, rather than in a display cabinet. They come in a nice variety of colours too, but we went for classic grey as I liked that they look like Converse! Hi, thanks for sharing this blog. i thing you can find this attipas baby shoes product are unique. i am definitely try these baby shoes for my baby.